The Chetco River has a great run of wild winter steelhead that begins in mid December and peaks in February, it continues until March 31st. 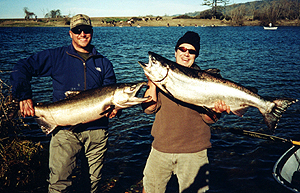 Steelhead in the low to mid 20's are taken each year, just take a look at our fishing photo's page. We will be fishing you in a drift boat, side drifting a small offerings of cured roe combined with either a puffball or a few other methods that offers a natural presentation with the current as we drift down this incredible fishery. Weather at this time of year is winter time so it's cold crisp and sometimes very wet but then again it can be beautiful and sunny. Dress in layers, wear waterproof footwear and bring raingear, sunglasses and a hat and certainly don’t forget your camera! 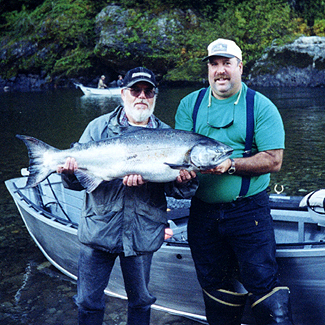 The world famous Chetco River brings anglers from around the World to fish for it's Chinook Salmon. When we hook you into one of these get ready for a big fight. The First of December March 31st. 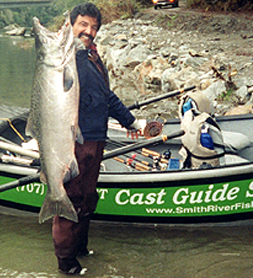 The Chetco River is home to some of the largest salmon and steelhead trout on the west coast. 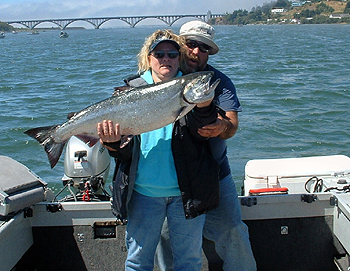 It is not uncommon for anglers to hook Salmon in the upper 50's to low 60lbs class. The Chetco River is short approximately 50 miles long. You will spend the day in a comfortable, heated drift boat that is also equipped with a rain top if needed. We start estuary fishing in mid October, trolling plug cut herring, spinners and spinner bait rigs. 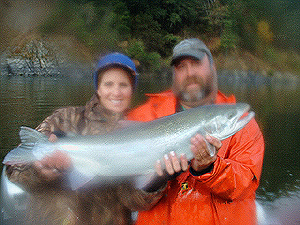 After fall rains begin king salmon begin to flood the Chetco's system. We will be pulling plugs, kwikfish, flatfish or Sting fish wrapped with a sardine fillet or back bounce roe bait through the slots and holes. When a big king salmon hits your plug you must prepare for a good battle, they are powerful. Salmon run begins in early October Through the first week or so in December. The Steelhead run begins Mid December running untill the end April 30th.